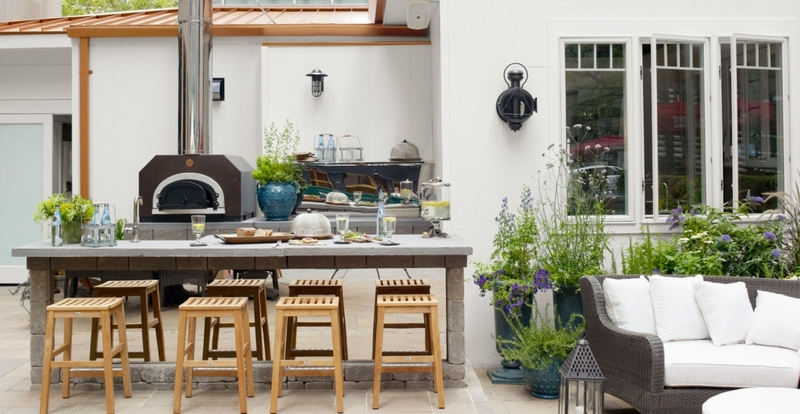 If you enjoy entertaining outdoors, or love to dine al fresco, why not take it up a notch and have your very own outdoor kitchen? Bringing the kitchen outside adds a new thrill to the cooking experience and is a fun way to prepare and serve meals. 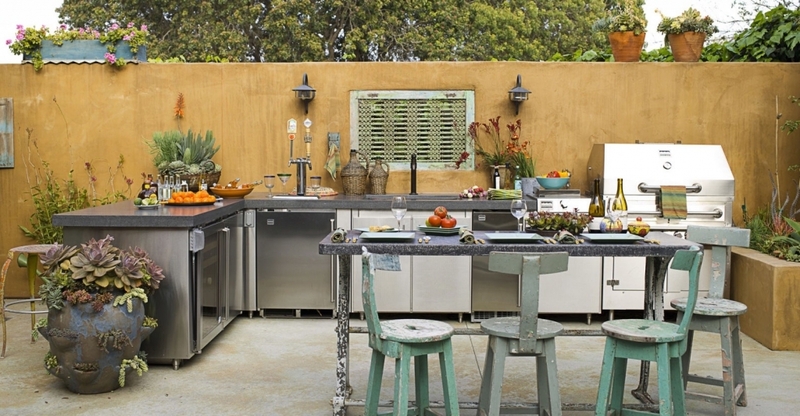 Get inspired by these spectacular examples of outdoor kitchens, so you can design the perfect one for your backyard. This gorgeous earthy kitchen combines handy appliances with salvaged materials to create a look that seamlessly mixes both modern and vintage styles. All of the essential kitchen appliances you would need to cook up a whole meal are neatly displayed against the fence of the backyard. To prevent the kitchen from looking really out of place, elements of the garden have been incorporated into the design. Across the counters are a variety of interesting and exotic looking plants which provide a brilliant burst of color against the gray backdrop of the appliances. Old reclaimed furniture gives the kitchen an air of maturity, while the chairs fully embrace the outdoorsy look with their earthy green color. The U shape layout of this strategically designed kitchen cleverly lays out the appliances from hot to cold. This kitchen has everything you could possibly dream of having and more! Moving from the left to the right, you will find a grill, a pair of cooktops, a pizza oven, a sink, two refrigerator drawers, a beverage cooler and an icemaker. If you enjoy a lot of sunny days where you live, it may be worth investing in a similar kitchen so you can cook out all summer long. Otherwise just stick to the basics. All of the appliances and stainless steel cabinetry are watertight, so you don’t have to worry about water getting in them, especially when the weather is bad, and the kitchen has to battle against the outdoor elements. Against the stylish fieldstone and granite backsplash, a bar area has been created with the addition of a counter and high chairs. 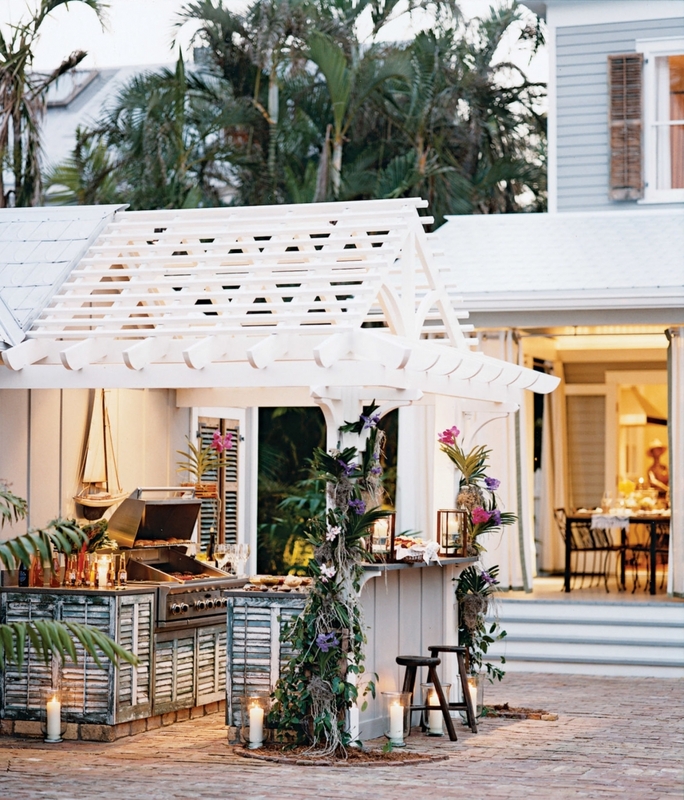 This makes it easy for you to serve drinks and chat to guests while preparing an outdoor feast. An oak ceiling over this outdoor kitchen adds some much needed warmth against the cold look of the stainless steel appliances and cabinets. To balance out the dullness of the dark silver gray, a clean, crisp white counter has also been added to brighten up the kitchen. The counter provides plenty of workspace for preparing meals and conveniently features a sink so you can easily wash up afterwards. Unlike a standard kitchen, the counter is also suitably positioned to face the guests so you can tend to cooking but also engage in conversation, rather than ignoring them. To pull the look together, the seating area features chairs which incorporate the stainless look of the cabinets, and white seats to match the counter. This calm and peaceful looking kitchen fully embraces nature and incorporates a mixture of natural and organic textures and colors. To build the gorgeous island in the middle of the kitchen, Weston Stone has been used for the base, and beautifully topped with bluestone. Reflective stainless steel covers the stone base to create a lighter look, while wooden stools lined up against the island adds rusticness. Despite the use of steel for the island, this kitchen refrains from using harsh looking stainless steel appliances in favor of a strong natural brick oven. The addition of planters brings freshness and vitality to the space, as well as providing the finishing touch to this natural themed kitchen. Instead of restricting terracotta to just plant pots, this whole kitchen has been decorated with the color! 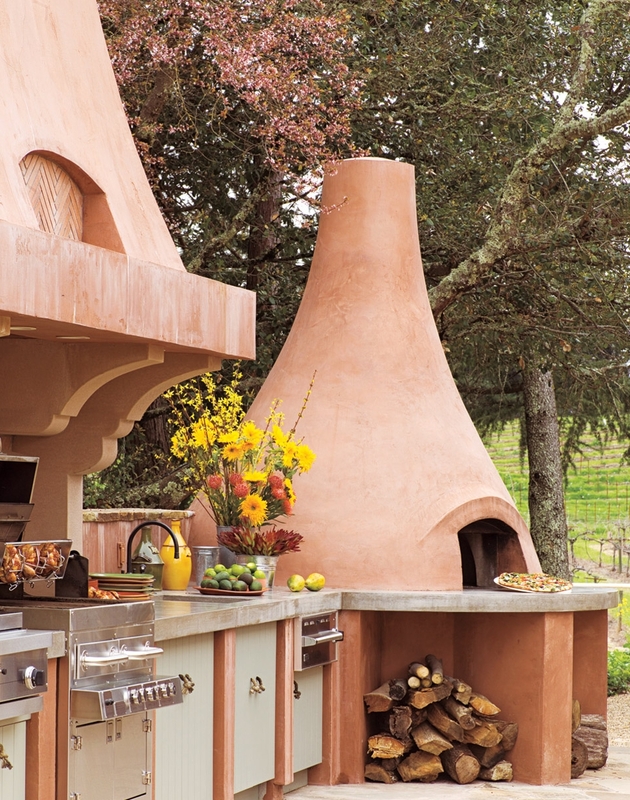 Taking inspiration from the earth; the warm, soft, shade of terracotta is infused throughout the kitchen including the backsplash and pizza oven. Installing a professional grill opens up many cooking possibilities, and depending on which one you choose, this fantastic appliance can offer the option of being started with gas, charcoal or wood. To break up the use of terracotta and prevent the kitchen from becoming a blur of orange, light blue cabinets have been installed which enhance the brightness of the kitchen. To the finish off the look, a gorgeous bouquet of red, yellow and orange flowers on the counter brings additional warmth to the space. Preparing meals for your friends and family can often be stressful, so it’s important to work in a calm and peaceful environment. This whole kitchen has been enveloped in blue to create a tranquil and serene atmosphere which will uplift your mood as you entertain. All of the cabinets are painted a soothing soft shade of blue which epitomizes relaxation, while the deep ocean blue caesarstone makes you feel like you’re inches away from a Caribbean beach. The addition of light fixtures featuring gentle shades of gray effortlessly blend well together with the blue, boosting the relaxing vibe of the kitchen as well as offering warmth. Many outdoor elements are embraced by this kitchen, which helps make it fit in as the final puzzle piece of this backyard design. 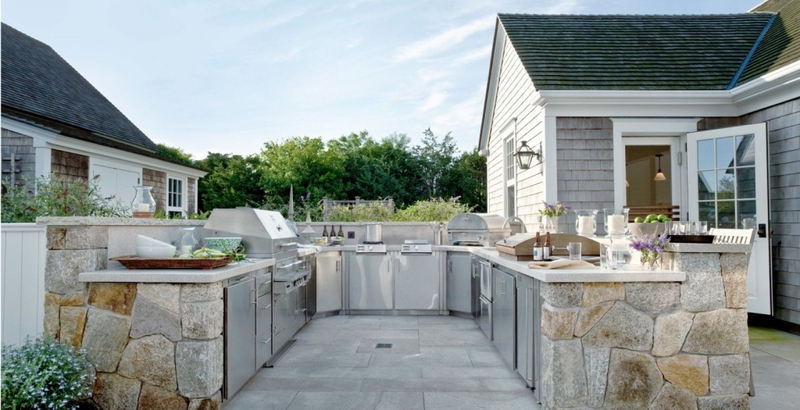 The problem with a lot of outdoor kitchen styles is that they can often look out of place and almost segregated from the rest of the backyard. 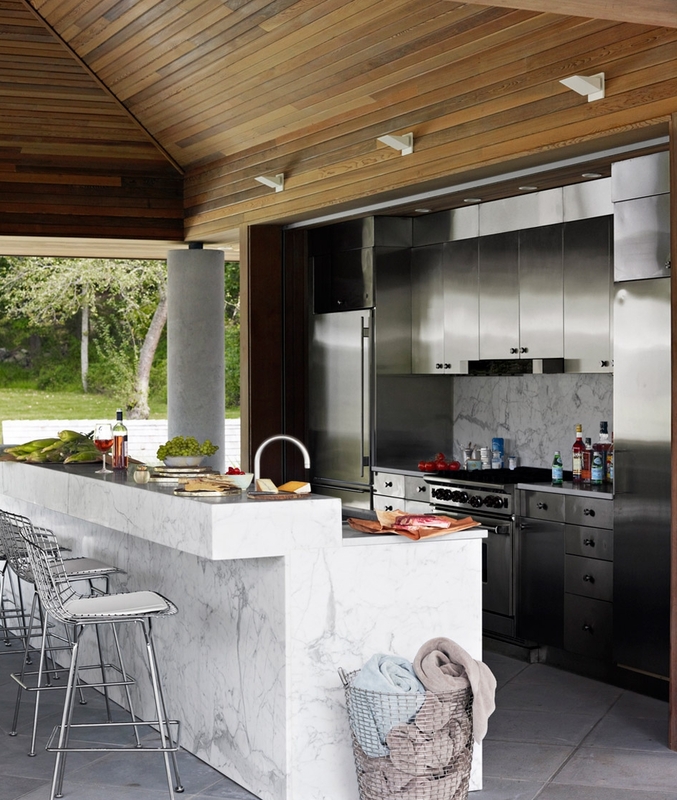 To prevent this from happening, natural features including a large variety of plants are incorporated into the design of the kitchen to boost its outdoor appeal. But it doesn’t stop there, as nature has also found its way to the cabinets. Instead of standard cabinets often found inside your home kitchen, these have been creatively made from old cypress shutters. 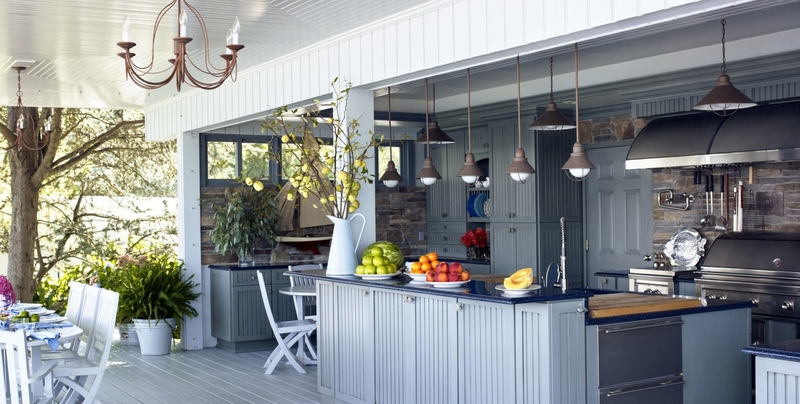 The old-fashioned design is reminiscent of the shutters used for beach huts and gives the kitchen a cheery summer vibe. During the night time, beautiful tall white candles are lit around the exterior of the kitchen to enhance the space’s chilled out ambience so you can easily relax and unwind at the end of the day.